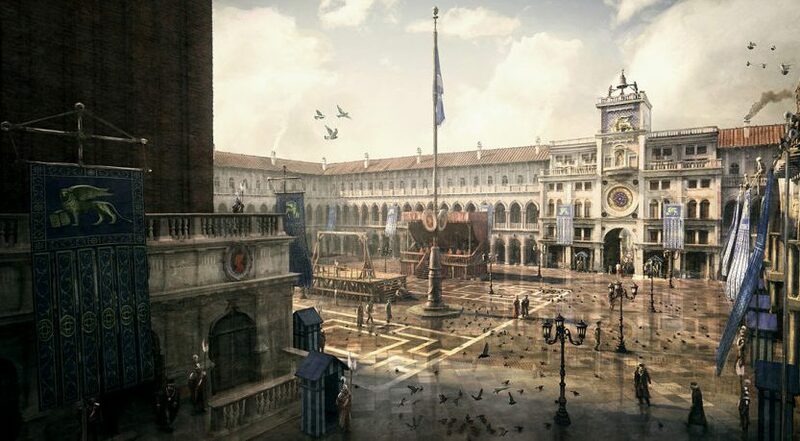 Venice concept art from Assassin’s Creed II depicting Piazza San Marco, circa 15th century. Swinging between the high-rises of Manhattan, paragliding over indescript Mediterranean towns, or strolling the canals of Venice, traversing video-game urban environments is the choice escape for millions. The comparisons between two similar in-game urban environments reveals the architecture at play can be as rewarding or as frustrating as the traversal system. Final Fantasy XV and Assassin’s Creed II both sought to create an ode to Venice with the virtual realisations of Altissia and 15th century Venice, respectively. Altissia’s abundant landmarks and elevated gondola network, one of several layers with significant geographical overlap and limited connection. Altissia was realised by Square Enix’s own game developers with the help of Italian translators, overstepping consultation with the architectural discipline and with it, the storied history of Venice that led to a beautifully complex system of canals and architecture. Responses to Altissia demonstrated an aesthetic appreciation but a spatial frustration; users exploring the city soon griped that the circulation was needlessly convoluted. Altissia had been designed to mimic the complexity of a layered circulation network without consultation to explore the urban and architectural histories that culminate in these kinds of networks. A single shot of Altissia displaying a promenade, streets, alleyways, elevated streets, footbridges, canals, and, elevated canals. Largely overlapped but sparsely connected. The developers of Assassin’s Creed II did not achieve an entirely authentic recreation of 15th century Venice, but where they made alterations they did so with informed limitations – like building heights sometimes exceeding what was built at the time for the purpose of gameplay. The historical and architectural expertise provided by Professor Marìa Elisa Navarro helped to shape a gameplay experience that utilised the nuances of the Venetian urban environment as plot devices, for example, secluded garden spaces as agencies of espionage. The authentic and meaningful realisation of architecture led to wide praise for the game’s urban environments, a guide the franchise still follows to wide acclaim. As in real-world urban environments, Assassin’s Creed II’s Venice allowed public spaces and monuments to provide direction and separation to circulation networks. Bernard Rudofsky described in Architecture Without Architects, “There is much to learn about architecture before it became an expert’s art.” With the advent of virtual worlds diversifying the design industry, bringing non-architects to the fore to create convincing virtual urban and architectural realisations, this sentiment becomes all the more interesting to explore in the “after”. Unlike the ancient tekt­ōn, game developers can draw on widely available examples of architecture throughout history, resulting in a semi-reactive organisation of form with the appearance of informed architecture. Assassin’s Creed II’s secluded gardens and courtyards realised as plot devices. When executed with authenticity in mind, and increasingly, the engagement of architects, this virtual endeavour can be a love letter to architectural achievements or a researched exploration of the past. However as architect engagement is becoming good practice in game development, it is not universal. So this copy-and-paste method of providing authenticity without the engagement of the architect reveals a possibility for this new frontier of spatial design and experience to suffer stagnation in the face of an emerging, though aesthetically variable, digital vernacular: form following form. International examples of vernacular architecture can be linked as a pure reaction to user needs and local circumstance, creating a folk design language absent the input of architects. Game developers are at risk of becoming subservient to a copy-and-paste vernacular serving only two aspects of the user experience, aesthetics and traversal. Without the sympathetic and rational approach bought to spatial arrangement by architects, improvised “authentic spaces” in the virtual quickly demonstrate a disconnect from their goal to user experience. Kollar, Philip. “Final Fantasy 15’s Lead Character was Inspired by Kurt Cobain.” Polygon, March 1, 2017. Accessed March 20, 2019. https://www.polygon.com/2017/3/1/14782394/final-fantasy-15-noctis-kurt-cobain/. Hamilton, Kirk. “Final Fantasy’s User Interface Is So Bad.” Kotaku, February 16, 2017. Accessed March 21, 2019. ­https://www.kotaku.com.au/2017/02/final-fantasy-xvs-user-interface-is-so-bad/. Saga, Manuel. “What It’s Like to Be an Architectural Consultant for Assassin’s Creed II.” ArchDaily,October 7, 2015. Accessed March 10, 2019. https://www.archdaily.com/774210/maria-elisa-navarro-the-architectural-consultant-for-assassins-creed-ii/. Astbury, Jon. “Playing the Architect: Why Video Games and Architecture Need Each Other”. The Architectural Review, June 25, 2014. Accessed March 7, 2019. https://www.architectural-review.com/essays/playing-the-architect-why-video-games-and-architecture-need-each-other/8664135.article. Edwards, Sarah. “Vernacular Architecture and the 21st Century.” ArchDaily, August 12, 2011. Accessed March 20, 2019. https://www.archdaily.com/155224/vernacular-architecture-and-the-21st-century/. Steam. “Steam Community :: Guide :: Guide to Totomostro Arena.” Accessed March 21, 2019. https://steamcommunity.com/sharedfiles/filedetails/?id=1496461778/. LanceaUmbra (@ Lanceaumbra). “#PS4Share,” Twitter, March 12, 2018, 8:48 a.m. https://twitter.com/Lanceaumbra?lang=nl/. Stack Exchange Gaming Blog. “Late to the Party: Assassin’s Creed II.” Accessed March 21, 2019. https://blog.gaming.stackexchange.com/2011/06/assassins-creed-2/. Dwiar, Rob. “There’s more to Assassin’s Creed’s Renaissance Italy than meets the eye.” Eurogamer, November 13, 2017. Accessed March 21, 2019. https://www.eurogamer.net/articles/2017-11-13-a-landscape-designers-take-on-assassins-creeds-renaissance-italy/. I am a Master of Architecture student with a passion for visualisation, science fiction design and the unrealised.